Designed for the fast-ball-speed player, which most golfers are, the all-new Speed LD F driver delivers an impressive 5000+ MOI for greater distance, accuracy and consistency. And the square alignment and precisely tuned clubhead and shaft generate high launch with a slight draw bias, giving you a much higher level of performance. Increasing the crown slope and deepening the dimples moves the CG lower and deeper. The result is increased MOI and high launch for greater distance. The large Speed LD face utilizes milled dual rhombus face insert technology to maximize COR. 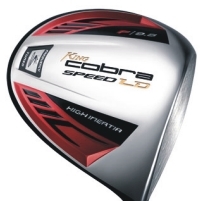 This technology provides the ultimate in ball speed and distance.